Topping out at the peak of the high index scale, 1.9 lenses are the “highest of the highest,” so to speak. 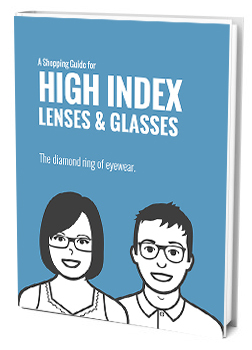 High index lenses appeal to wearers of strong-to-extremely strong prescriptions because they can reduce the bulky size, weight, and distortive features of thick lenses. No lens does this more than the 1.9, which is highest index material currently available. However, the reduction in thickness and weight they provide comes at a price… quite literally. 1.9 high index lenses also top out the scale in terms of cost. As one travels up the index scale, anything over 1.74 switches from high index plastic to high index glass. Glass lenses have some innate weaknesses – they’re more brittle, for example, and weigh more than plastic – but also enjoy some innate strengths; they’re highly scratch resistant, for example, so require no additional anti-scratch coating. Glass lenses also provide a visual clarity that plastic lenses cannot match. While high index glass lenses are heavier than high index plastic lenses, one should not conflate them with standard (low index or mid-range index) glass. Because high index lenses require less physical material to create a prescription, they are much thinner than standard glass lenses, shaving off valuable ounces. A prescription fashioned of high index glass will be significantly lighter than the same prescription in standard glass. That weight reduction, for anyone requiring severely high prescriptions, means a lot in terms of fit and day-to-day comfort. Along with weight reduction, 1.9 lenses are also notable for being the thinnest possible. Again, if your prescription is very strong, standard glass or plastic material will result in very thick lenses with a deep curvature. This limits the frame styles you can select. Rimless, semi-rimless, and indeed just about any wire frame choice would be out; you’d require thick-framed glasses to help mask the ends of the lenses, which protrude from the inner side of the frames toward the face. 1.9 lenses are nearly 80% thinner than standard, 1.5 low-index lenses. my prescription is -12 for both eyes. What kind of high index lenses you recommend for me? I would suggest the High Index 1.74 for a plastic lens. 1.90 would give you the thinnest lens, however because it’s glass and the glasses would be heavier. And you also run the risk that should the glasses fall or dropped by accident they could break easier. Hi…my prescription is minus 9 in both eyes.should i go for 1.9 index lenses? Also what is the cost of such lenses here in india and from where can i buy them? Hi, 1.74 index lenses would give you the thinnest lenses with that high a power. I am not sure about its cost in India or where you can buy them, but we do ship worldwide. Feel free to browse our website and see if there is anything you like. My lens prescription is +6.5 in the right lens and +8.5 in the left. I am looking for the least amount of eye magnification possible. What lenses should i go for? Hi…my right eye is -13 and my left eye is-17 ….which kind glass I can use??? Without making the lenses in your full script and for your frame we will not be able to tell you how thick the lenses would be.